Ready for some unique stuffed dinosaurs and plush dinosaurs? Tongue twisters, here we go. 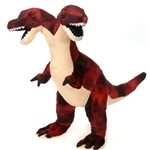 How about a stuffed pteranodon, a plush velociraptor, or a stuffed diplodocus? Not weird enough for you? Maybe a plush parasaurolophus, a stuffed spinosaurus, or a plush ankylosaurus suits your fancy. If you are getting specific requests for a stuffed parasaurolophus, or any of these plush prehistoric pals, then you probably have a future paleontologist on your hands! Feel free to play pronunciation games with the stuffed dinosaurs on this page or to try to name the regions where these prehistoric pals used to be found. Also, can you ask your future paleontologist why dinosaurs always have to have so many syllables in their names? It makes things hard on those of us who aren't inclined to know what a parasauralophus is and why it's called that!